Remember when I used to be heaps into photography? Yeah, me neither. I still kind of am, but not as much as I used to be. I don’t know about you, but photography was always a “make an effort” thing for me, for the kind of photography I wanted to do (i.e. mostly street photography). I still want to take photos of random people or things on the street in order to tell a particular story, but that involves actually leaving the house — something that doesn’t happen every day because I’m a hermit used to the comforts of working from home most days. Take today, for example. There was an elderly couple standing outside my work today, looking up at the construction across the road. I glanced up, and the way our glass sliding doors framed them, just gazing up at the construction work going on, was kind of nice. For a brief moment I considered taking a photo, but decided not to because it would have been a little strange. I’m drawn to couple photography particularly, which probably says plenty about me personally. There’s stories to be told for inanimate objects and individuals, but couple photography fascinates me. One of the best shots I’ve ever taken was a quick spur of the moment thing, like most street photography, depicting a young girl in a school uniform sitting with a guy, also in school uniform, on a bench in the Hobart mall. You don’t know what they’re talking about, or why they’re sitting there, and you kind of feel like an intruder on their private time, but it’s a nice photo. At least, I think so. It reminded me of the times when I carried my film rangefinder as an every day carry kind of thing. Some people lug around DSLRs, but my Bessa R2A is compact enough to not get completely in the way or be too much of a burden. I mean, sure, I always have my iPhone 6 with me and that takes some seriously good photos, but digital photography has always felt kind of cheap, like it’s too easy to achieve good results without even trying. I’m not saying that’s a bad thing, but when you can fire off a single-shot HDR photo just by tapping a button, it kind of cheapens the experience a little. 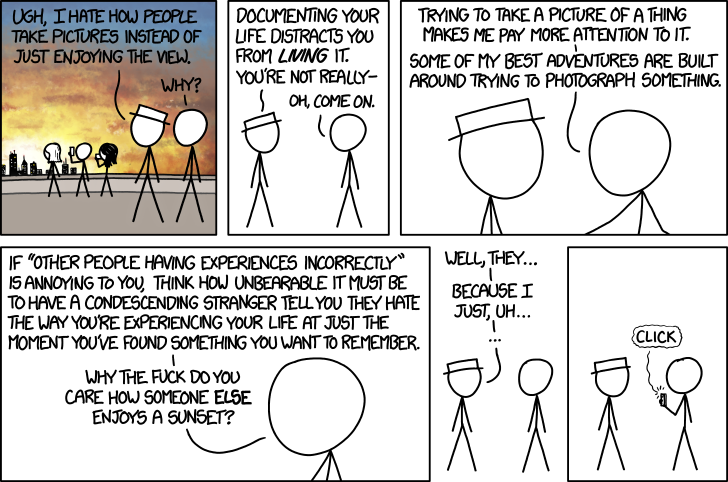 On the above XKCD: I’ve never understood people who criticise other people for taking photos of things that mean something to them. Why does it matter how other people choose to enjoy a particular sunset, or a bunch of fireworks going off? Just looking is nice, but there are some that want to capture the moment so they can come back to it later and then there are some who recognise the technical challenges of capturing multi-coloured explosions in the sky. Either way, that’s their prerogative. Who are you to say otherwise?